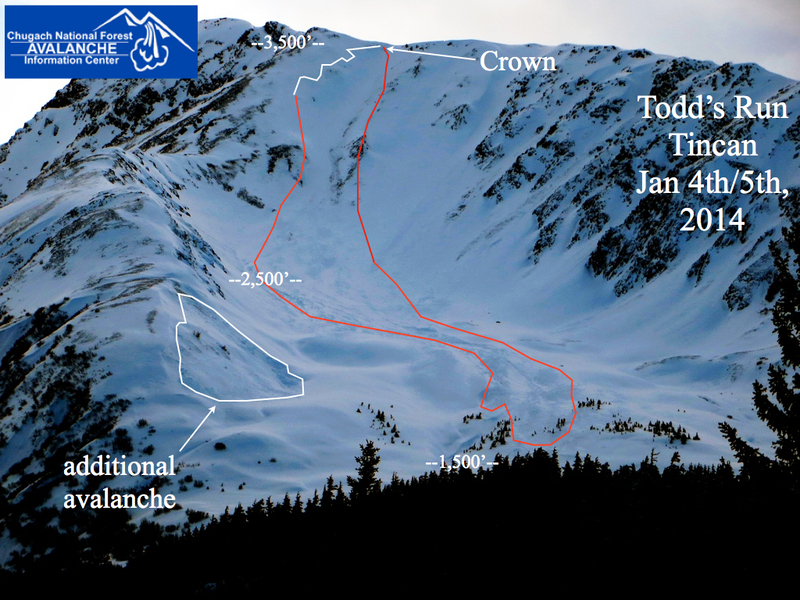 The avalanche hazard is CONSIDERABLE above and below treeline today. It will be possible for snowmachiners, riders and skiers to trigger dangerous slabs up to 3 feet in depth on slopes at and above treeline. Below treeline, warm temperatures will make it easier to trigger slabs up to 2 feet in depth on steep slopes, gullies and rollovers. CNFAIC forecaster Wendy Wagner will be giving a free talk on Avalanche Awareness at REI in Anchorage Tuesday night at 6pm. The course is currently full, but check with REI Anchorage to get on the waitlist. The snowpack received a serious shock over the weekend. Over a foot of new snow fell in a short period of time on Saturday night Jan. 4th. This resulted in widespread natural avalanching throughout the forecast area. High winds have eroded the snow near many of the areas that have avalanched, making it hard to see this evidence. Yesterday we were able to see this evidence but it was not blatantly obvious. What we do know is that the snowpack still has a weak foundation. Time will allow the snowpack to adjust to this newest load to some degree. However, it has been only one day since we have had significant natural avalanche activity. The snowpack simply needs more time to adjust. The consequences of triggering an avalanche right now are potentially severe. Dense slabs ranging between 1-3 feet deep are laying in wait for the right trigger. This may come in the form of a large group, or it may just take one person to hit a thin spot in the slab. Now is an important time to recognize and avoid likely trigger points. Areas of shallow snow, convexities and steep slopes should be avoided today. Below is an image of one of many large natural avalanches that occured over the weekend. New snow, warm temperatures and moderate wind (out of the East) will make it possible for humans to trigger shallow new wind slabs in steep terrain. These slabs on their own will not be large. However, triggering one of these newly formed slabs will have the potential to trigger deeper weak layers in the snowpack. It will be important to avoid steep slopes especially in areas receiving 6 or more inches of new snow and wind today. In the past 24 hours a trace of new snow has fallen on Turnagain Pass. Girdwood valley has picked up another 3-5” of snow. Temperatures climbed overnight with ridge top stations in the high 20s F with the Turnagain Pass SNOTEL (1,880’) showing an overnight high of 36 F. Winds at the Sunburst station have been light to moderate out of the East averaging 18 mph. Today expect cloudy skies and snow showers mainly in the first half of the day. Snow accumulation of 4-6” are possible. Ridgetop winds will be out of the East at 25-30 mph. Temperatures will remain mild, in the low to mid 30s F at 1,000’. The weather pattern to our South and West is complex. Computer models are doing a poor job of projecting weather beyond today. Expect unsettled weather over the next several days with modest precip amounts and generally mild temperatures.